I made these cupcakes on the fly! Well let me back up first and say hi again to everyone, it’s been a bit since I last posted and since the last time I had a chance to read everyone’s awesome blogs. I have a lot of catching up to do! It’s been a busy last few weeks. So busy that I’m not even posting a Vegan Rescue original here… I know I know. While I do have a few vegan vanilla cake recipes of my own, this morning I decided to make cupcakes using the old web, it was much quicker than digging one of my own out and my time was limited. My son’s Spanish class today was celebrating Dia de Los Muertos (Day of the Dead), so on the fly I made these cupcakes and added a little cinnamon and sugar love to them. 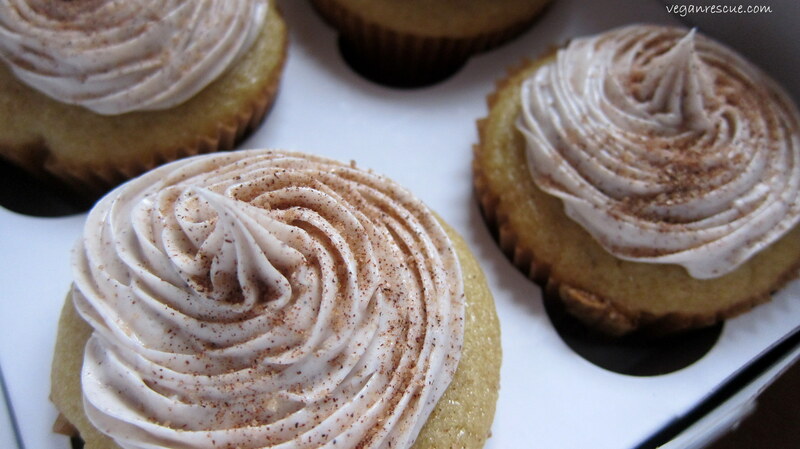 With the cinnamon and sugar of churros in mind, I incorporated cinnamon mixed into the icing and then sprinkled with a mixture of organic cane sugar and cinnamon. Store-bought icing works well too using the cake base. Enjoy! Check out Sam’s recipe here on the It doesn’t taste like chicken blog.